Let’s face it: childhood isn’t what it used to be. From exhausting homework loads to the omnipresent clicking, ringing, and vibrating of technological devices, children are subjected to an endless stream of distractions and stress. The results are predictable: a near-epidemic of anxiety disorders over the past generation or so. Sadly, most children with anxiety disorders don’t get the treatment they need. The best treatment protocols blend therapy, medication, and lifestyle changes. We can help you choose the best strategy from each category, ensuring your child gets first-rate care in a comfortable setting. But before we can help, you’ll need to be able to properly identify that your child needs help for an anxiety disorder. Here are five telltale signs. Oftentimes a stressful life even triggers an anxiety disorder, so it’s important to carefully monitor your child during times of stress. If he or she seems unable to bounce back from the struggles of daily life, it’s time to get help. Changes in appetite; anxious kids often lose their appetites. Complaining of headaches or other unexplained pains. Childhood is a process of slow evolution and change, and it’s normal for kids to change their personalities or interests during major milestones. The child who once loved reading might suddenly, at puberty, prefer to spend her time texting boys, for example. But if your child’s personality or mood changes without explanation, it’s a major warning sign. Anxious kids will do anything to get relief from their anxiety, including giving up friends and hobbies they once loved. Some retreat into themselves; others begin acting out, desperate to get the attention and help they need. If your child doesn’t seem like himself, it might be because anxiety is making it too difficult to be normal. Many anxious children are introverts plagued by shyness. Some struggle with social anxiety. And almost all kids with anxiety disorders behave in ways that other kids find strange. Kids can be cruel, and they’re highly adept at detecting unusual behavior. 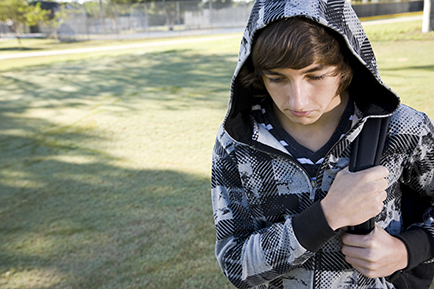 If your child struggles to make friends, seems scared of going to school, is frequently victimized by bullies, or constantly complains of being isolated, these could be telltale signs of an anxiety disorder. Anxiety tends to get worse with age, so the best time to get your child’s anxiety under control is now. Let us show you what you can do to help. We’ll coach you and your child through the process of managing anxiety, offering compassion, support, and children counselling that’s free of judgment.